As human spirits, I believe it is our birthright to live in a state of peace and joy. So each morning the first thing I ask myself is, “Am I feeling peace and joy right now? If not, why not?” Next I proceed to search my mind and heart for some thought or feeling that might be blocking my sense of serenity and jubilation. Often the impediment is linked to some element of fear. Lately, I have become aware of how I, and the individuals I meet with in spiritual direction, are held hostage by fear. Easily and quickly I can enumerate a list of fears and how they puncture my peace and steal my joy. As I reflect on my many apprehensions as well as those I hear in the sacred stories of others, I wonder how we all might lead lives of greater inner freedom. In “Escape from Fear-Part One,” I will name and describe some fears and in Part Two, discuss potential antidotes. The fears I address here include the fear to follow my heart’s desires, fear of rejection, fear of success/failure, fears associated with a psychological syndrome called “time urgency perfectionism” and fears about the body. Clearly, many people suffer with serious anxiety often requiring medication and therapy. However, in the next two blogs, my focus is on the common fears that permeate daily living. Many years ago, I started my career journey. I knew I needed to take a year off after college but I was afraid I might never return to graduate school. So despite my trepidations, I entered a PhD program. I wasn’t particular happy studying social psychology because I had always been drawn to counseling. I yearned to help people with everyday problems like loss of a job, divorce, or death of a loved one. But I persevered because I had enrolled at Harvard University and I was afraid to disappoint my family or appear as if I lacked the intelligence or determination to finish their doctoral program. As I prepared to graduate, I considered pursuing post-doctoral studies in counseling. Completion of a few requisite courses and some internship hours would have led me to my dream. Yet I was afraid to turn down the outstanding job offers I’d obtained at University of Michigan, Ann Arbor, Duke University, and UC San Diego. I continued to walk this journey allowing fear to act as my oppressor. I permitted concerns about money, reputation, and living up to the perceived expectations of others pin me down onto a path of unhappiness. It wasn’t that I lacked courage but I wanted certain and calculated outcomes. I wasn’t a risk taker. 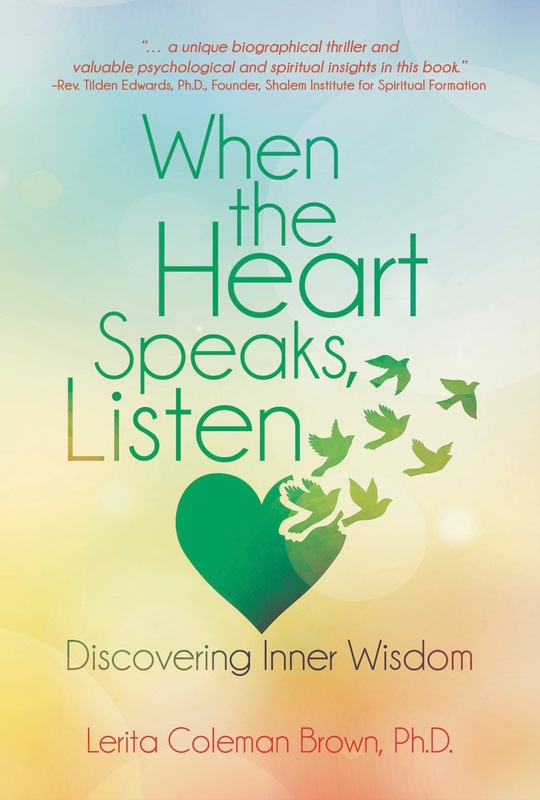 Recently, I awoke panicked wondering if I was doing enough to promote the release of my new book, When the Heart Speaks, Listen—Discovering Inner Wisdom. Last summer, I anguished for several days about asking a prominent person for an endorsement. I feared he would say no or worse yet, read my book and tell me he couldn’t endorse it. I was experiencing the fear of rejection. I prayed and finally summoned the inner strength to email him. He was delighted to write a lovely endorsement. Later I realized what a senseless fear this was. Last month I spoke with a woman I hadn’t seen in years. When Amelia heard that I was publishing a book, she shared her desire to write one as well. After a recent speaking engagement Amelia was approached by a book editor about a potential book project. Yet she never followed up. I was shocked. Writers send thousands of query letters each day seeking a literary agent or an editor. I wondered about this bright professional woman—was it fear of success or fear of failure that was kept Amelia from pursuing her aspiration particularly when an editor had expressed interest in her work? I find that fear of success and fear of failure are different sides of the same coin—fear. Fear is the way in which the ego inhibits intelligent and competent people from expressing their deepest passions. Fear of failure is often linked to concerns about making mistakes, being embarrassed or not living up to the expectations of others as I mentioned earlier. Fear of success is frequently related to an underlying sense of unworthiness. Sometimes we don’t think we deserve success and happiness because somewhere someone usually a parent, relative, teacher or supervisor, suggested we lacked some essential attribute; a skill, intelligence, physical attractiveness or other characteristic. A close cousin to fear of success and failure is time urgency perfectionism. I notice this fear seeping into my days and controlling my life. Most people are familiar with the notion of perfectionism but perhaps not paired with a time component. In Faster, Better Sicker, researchers identified a personality type associated with Time Urgency Perfectionism Stress (TUPS). They write, “These are people who always like things to be perfect and therefore attempt to achieve perfectionism within a defined time frame.” Such people constantly watch the clock, worry about deadlines and completing tasks perfectly. The lives of time urgent perfectionists become encased in fear—they agitate over errors and fear there is never enough time. Yet living from an inner world dominated by fear, experiences of peace and joy elude one’s grasp. Occasionally I feel heart palpitations. In the past, my thoughts would immediately begin to race and descend into a downward spiral. I would tremble about what might be wrong with my body. I’d wondered—did I need to go to the ER, urgent care or set up an appointment with my cardiologist. Similarly, I hear about family members, friends of family members, and others who develop preventable health conditions. Typically, an unwillingness to seek medical attention and then follow the doctor’s instructions is partially to blame. Some people dig in with denial. “Oh that pain in my arm—it’s nothing. I was lifting heavy boxes.” I cried as I read in Becoming, about Michele Obama losing her precious father. He was afraid to see what was beyond his swollen feet, and nodule in his neck. Her dad kept working until it was too late after which there was no possibility for recovery. I have heard this story far too many times as I reflect on the losses of loved ones in my own life. Perhaps underlying all of the apprehensions about the body is the fear of death. Which fears are holding you hostage in your life right now? When is the last time you felt some deep peace and how long did it last? And what about joy? Does joy feel absent in your life, more like an infrequent visit from a long lost love rather than being central to your life? In “Escape from Fear-Part Two,” I will discuss how we might break the chains of fear. Meanwhile, I hope you will take a moment to reflect on which fears keep you from feeling the peace and joy in your heart. Antonio Rodriquez, Edward Wolff, Many Wolff, Faster, Better, Sicker-Time Urgency Perfectionism Stress, available on Amazon as a Kindle download. Ten days ago, three days before I was to give a public lecture on Howard Thurman’s, The Mood of Christmas and Other Celebrations, I experienced an episode of complete mental exhaustion. I could not read and every time I moved toward the desk to finish the talk, my mind rebelled. I took to the bed and slept most of the day only arising to eat, I felt like I was desperately running out of time. I had experienced physical exhaustion before but I couldn’t remember ever being so mentally fatigued. It had been an extraordinary time. After spending Thanksgiving week caring for Warren’s parents aged 95 and 92 respectively, we drove home to Atlanta from Miami. A grueling one day drive, we stopped only for bathroom breaks and meals. Fortunately, the road trip was punctuated by a quick stop by Howard Thurman’s childhood home in Daytona Beach, Florida. The day after our return I received the 2nd proofs for my soon to be published book, When the Heart Speaks, Listen—Discovering Inner Wisdom. I jumped right in knowing that book production deadline are always AS SOON AS POSSIBLE. After about 3 to 4 days of intense focus and recording each correction or change on a special spreadsheet, I moved to the next task. Preparing an online retreat for the Shalem Institute for Spiritual Formation on Howard Thurman’s Jesus and Disinherited was a project that had lingered on my desk far too long. It’s delayed birth was caused by a number of issues including grieving the passing of my brother in September. Once I submitted my final scripts for review, it was time to tackle my presentation on The Mood of Christmas. In between these tasks, I shopped and purchased (mostly online) Christmas gifts and hosted with Warren, an annual tree trimming party for family, neighbors, and close friends. People are attracted to this event each year because we make every dish from scratch and I am known for the very fudgy brownies and a sweet potato cheesecake. In addition, I made an artichoke dip and a salmon moose. The next day, my feet, legs and back ached. It is not surprising that I crashed. For year, I have struggled with Christmas. As a child, Mom and I conducted the majority of Christmas shopping for extended family and I wrapped most of the gifts. We also decorated the tree, baked Christmas desserts and prepared all of the holiday meals particularly Christmas breakfast and dinner. By the end of Christmas day I was exhausted and wishing that Christmas occurred every 5 years instead of annually. As an adult, this tiring experience continued because as a professor final papers and grades were always due just before Christmas. Typically, I scrambled to purchase and wrap gifts, catch a flight, and often arrived home just in time to help mom with the yearly cooking chores. I dreaded Christmas each year yet I married a man who loves Christmas! He looks forward to cooking desserts and is delighted that he married an expert gift wrapper to help with the same tradition of gift exchange with his extended family. To say that my mood at Christmas is frazzled and stressed would be an understatement. 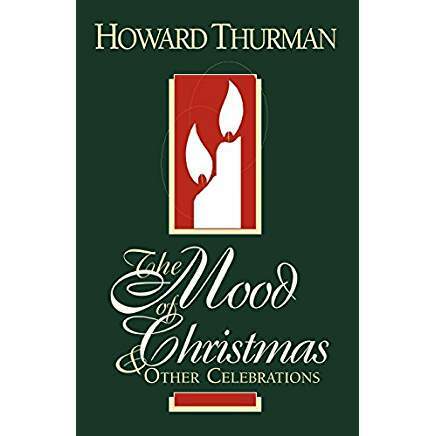 I’ve been yearning for something different during the holidays and I found it in Howard Thurman’s, The Mood of Christmas. Thurman writes that “as human spirits we need times of celebration to help us to know our significance in the continuity of life, in the flow of life in both a personal and collective way. This sense of continuity is the ultimate windbreak against the ever-present threat of isolation and separation from surrounding environ.” He notes that there is something special about the atmosphere at Christmas. It is unique and distinct from all other times of the year. The lighting of candles, hanging holiday decorations, construction of crèches, and preparing of festive meals add a special sparkle that lets us know it’s Christmas. Christmas is truly about celebration. Howard Thurman says Christmas is a reminder that God has not left us alone in the darkness-the spirit of Light, the spirit of Love that Jesus let loose in the world is ever-present. He asserts that Christmas is a time of hope regardless of whether a person is Christian or non-Christian, cheerful or sad, strong or weak. Christmas is about revisiting or renewing the notion of hope that the Light comes again and again into the darkness of the world. I am reminded of the Light within (“This little light of mine”), we each carry, the same light that God placed in us—that cannot ever be extinguished no matter how bad things appear. The question I pose is can we hold on to this hope, can we not let the “the shadow of the event” as Howard Thurman often names it, dim that light that God has placed in us. Life continues, life is good because we remain a part of God and each other. The Peace and Joy of God does not go away because there are wars, hurricanes, floods, fires, or because the political climate changes. Christmas, with its special mood comes to counteract the mood of the world. This annual celebration of the birth of Christ stirs hope, brightens that light of the Christ within which may have grown faint during the year. Thurman also argues that Christmas is about the sharing of graces in a world that in his time he described as callous and uncaring. Yet these same words would describe our atmosphere now in 2018 even though Thurman published this book in 1973. Christmas is the perfect time to cultivate a spirit of kindness and compassion and if we internalize this spirit, Christmas can be every day. Perhaps now I am ready to cultivate a different mood at Christmas. What is your mood this Christmas? Can you be a bearer of the Light in this cold, dark world? Does something in your atmosphere this Christmas highlight love, hope, reconciliation, grace, and connection? How can you cultivate an inner ambience this Christmas that will allow you to feel more of the peace and joy in your heart?